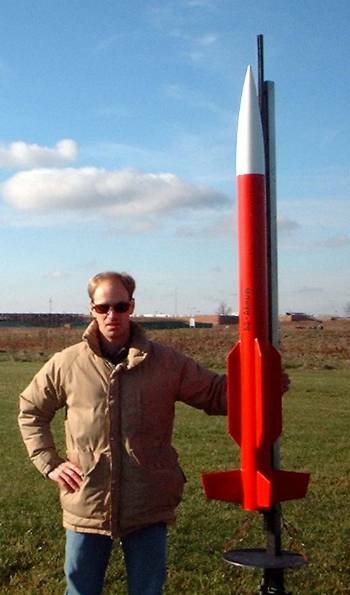 Chan Stevens has stepped up to run our third guest-run Virtual Rocket Contest. He has developed a contest that may seem difficult, but in reality is focused on competitor strategies. Being such he has decided to call this the: Virtual Iron Rocketman Competition. Entries must be received by 1/16/2006. Contest will take place from 1/17 - 1/23. Clusters are acceptable, though must light simultaneously at launch. Empty tubes allowed for events. Motors used may be smaller than motor tube, but not larger. Every flight must deploy a recovery device or be DQ'd. Any velocity at landing exceeding 40 ft/sec will be DQ's as unsafe and the model will be considered destroyed. #1 - (C) Streamer Duration: Motor choices restricted to C impulse*. You may fly this up to two times. Your score will be the combined duration of your qualified flights. You must return at least one to place. Streamer can be any material, but must fit realistically in the model. #2 - (B) Parachute Duration: Same as event #1, though recovery method must be parachute, and motor impulse* is B. #3 - (C) Altitude: You may fly this up to two times, though your score will be the single highest flight with motor restricted to C impulse*. In the event that a track is lost, the contestant has the option of 1) not counting the flight and re-flying, or 2) counting it as a qualified flight. #4 -Open Spot Landing: You may fly this event just once, and select any motor. Your score will be distance to a pin located 135 feet downwind of the launch pad. Closest to the pin wins. #5 - Drag Race: your rocket will fly on any motor and at a launch angle of your choosing. The score for this event will be based on a combined ranking from each of these categories. Field Size: Model loss based on site dimensions and drift distance beyond site. Field would be a half mile radius, mile diameter. Considered lost outside of that range. Each contestant gets to bring two identical models/copies to the field (one design). This means if you lose 1, you can continue flying, but if you lose a second one, your day is done. *Impulse clarification--total impulse (any combination of motors) must conform to NAR impulse ranges for the class. B=2.51-5 NS, C=5.01-10 NS. For open class events, total combined impulse cannot exceed 160 NS. Bob returns trying to reclaim his status atop Olympus with the "Lil' Pink Rocket of Zeus". One of (3) 13mm designs, I can see why Bob has routinely been a top performer-attention to detail. Among the 5 variations submitted, there were over 400 simulations (Bob claims only a hundred or so weren't copied over from file to file). He even went as far as folding the streamer for duration events, but packing it unfolded/flat for altitude and spot landing. Sadly, he seems to have neglected his trademark lightning bolt fins. David rounds out the newbie class with a carefully designed "Entry". Boasting Texas pride decals, David's design is short, skinny, and barely large enough for a motor, let alone some of the larger streamers of the competition. I've seen launch lugs that are bigger than his entry. Let's hope the virtual trackers can get a reading on this little guy. Bruce returns with the Steely-Eyed determination of a veteran frequently among the top performers. With precision calculation of optimum rod angles, and a 5x500 streamer that fits "virtually" perfectly inside his tube, he's poised to soar. Check out another cool decal design. "Bah Humbug"? I wonder what Claude was up to during the Christmas season. One of (3) 13mm models, it's the lightest in the field. It looks like he was dipping into the egg nog when attaching the fins, though. If I didn't know better I'd say he attached at the tip, not the root. The first newbie of the contest, Michael's Fast Bird III sports classic styling, and a monster 40" chute. He'll get plenty of exercise retrieving that bird. Watch out for the log! More like a stubby number 2 pencil, you can't beat it with a stick. Check out the fins (or lack thereof). The optical illusion is that they're translucent. Bill's "Eisenmann" is another relative longneck at 14.8 inches long. Another cool decal job. The question is, though, will it fly like balsa or like iron, a little over double Claude's weight? Peter returns as a semi-newbie with his Stanley Streamer. His 6x60 streamer and 14" long design still come just a few grams over half an ounce. Remi's "Explorer" makes (3) first-timers and one second-timer out of the first 8 entries. His efficient design is about twice the length of Claude's, 18mm diameter, yet only slightly heavier. Big fins, though, might be a bit of a drag on performance. Jim's "Ivan" is a no-nonsense design. It's the longest and biggest diameter entry in the contest. We'' see how that 8.5" wide streamer holds up. 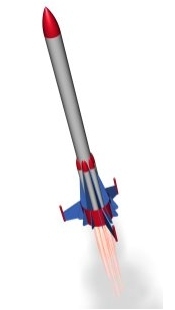 Another virtual newbie, Rich's "Ironman Rocket" hopes to grab some hardware in this contest. Show me an example of submission data to this contest? The strategy above would require 5 rocksim files, with the only difference between them being the recovery device. Note that while this strategy might safely get you points in each event, it could be hard to get a multiplier for higher placement without more aggressive flights. An event "placement score" is determined based on your rank and weighting multipliers. Example--You place 3rd in the C altitude. Your score would be 10 (WF) times 4 (rank multiplier), or 40 total points. You place 11th in Open Spot Landing. Your score would be 4 (WF) times 1 (rank), or 4 total points. You DQ in B-PD due to recovery device failure (separation). Your score would be zero (must be a qualified flight to score). Do I have to fly the events in order? No. Of the 8 contest flights, you may choose which ones you want to fly in sequence. For example, you could fly OSL, drag, altitude, streamer, altitude, streamer, chute, chute. Do I have to fly the same file for both flights in the duration events? No. You may use different files for first and second flights, as long as you specify which files is used for each flight. Changes are limited to recovery device size and mass object (nose weight).